LongChaoShou is a famous Sichuan local cuisine restaurant in Chengdu, they focus on a variety of popular dishes such as the 龙抄手 (long chao shou) spicy wontons, 钟水饺 (zhong sui jiao) boiled dumplings, and noodle dishes as well. During my first trip I tried their 担担面 (dan dan mian) dan-dan noodles. The Sauce - is a mixture of chili oil, sesame oil, soy sauce, garlic, peppers and a large variety of exotic Sichuan spices. Dan-dan noodles are suppose to be spicy and filled with the aroma from the different spices, but here the sauce is a little too salty. 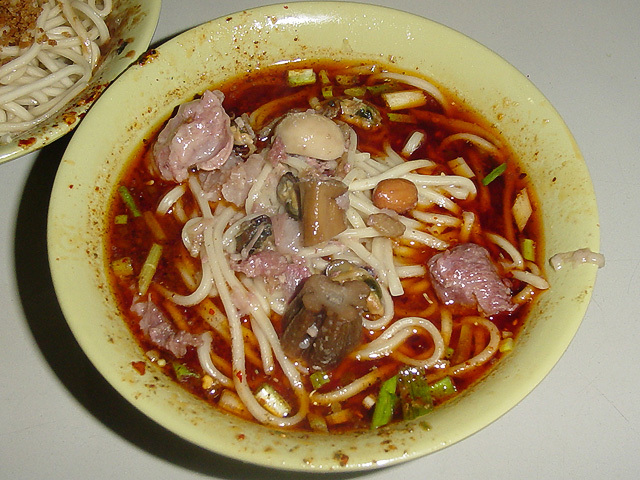 The Noodles - are thin straight noodles cooked soft. Hardly any texture to these noodles, maybe this is the standard for Sichuan noodles but I didn't enjoy these soft noodles much. The Toppings - are some dried fried pork and a few leaves of spinach. The pork adds a lot of flavor to the noodles when you mix it well with everything but doesn't add any texture to the dish. Overall - the sauce and noodles were dissapointing. The famous dan-dan noodle combination of aroma and spiciness just didn't quite hit the mark, while the noodles were too soggy for my preference. LongChauShou does have a lot of other authentic dishes for you to try out and is worth coming for their wontons and dumplings. 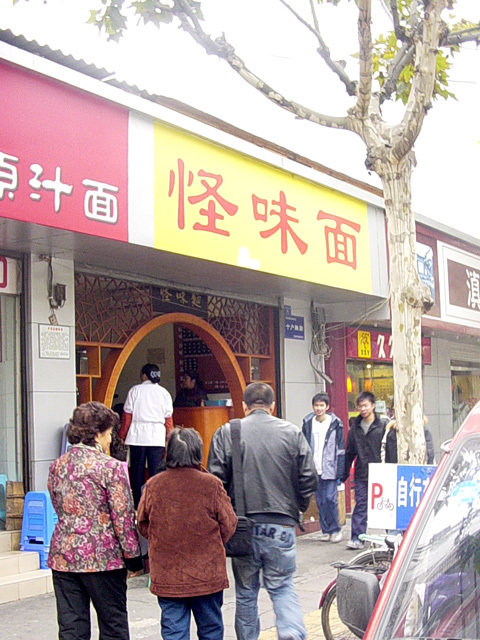 LongChauShou's has many chain stores all over Chengdu, though the store I visited is their original store which is located on Southern entrance to the ChunXi road shopping district. Ore no Sora ("My Sky" in Japanese) is a ramen shop near Takadanobaba station that used to be the darling of the Tokyo ramen scene. A few years back you needed to wait 40 minutes plus just to get inside, today it seems the fad has died down quite a bit. I was able to get a seat around 6pm my last trip there and I tried their 豚玉そば (Buta tama soba) pork and egg noodles. The Soup - is a rich, thick tonkotsu soup blended with a Japanese seafood soup. The strong flavored pork bone soup is well balanced with the strong aroma of the seafood, but it maybe a bit too heavy to eat as a soup for some people. The Noodles - are thin straight noodles cooked very firm. These dense noodles are chewy and a great match with the flavorful soup. The Toppings - the kakuni slow simmered pork is very tender it practically melts in your mouth. The flavored boiled egg is cooked just right with the yolk slightly runny. Overall - a very delicious tonkotsu/seafood blend soup ramen. While well reviewed and popular ramen place for many people the soup is still a little to heavy for my preference. 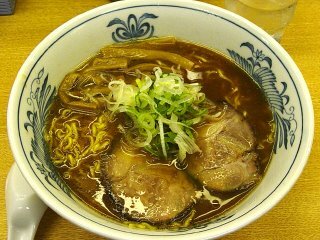 For ramen in the same category I recommend Miharu in Ebisu/Ikebukuro and Hayashi in Shibuya. Ore no Sora is very easy to get access. Take the JR Yamanote line and get off at Takadanobaba. Take the south exit (called the 戸山口 Toyamaguchi exit). From the station walk 1 minute south and it will be on your right hand side. 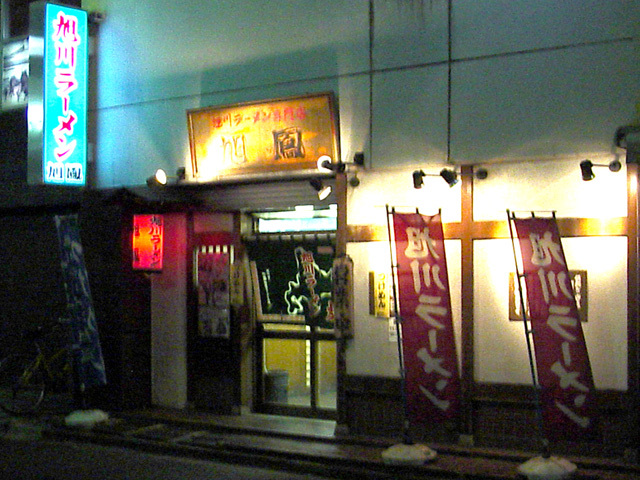 Higonoren is a Kumamoto style ramen shop that has been around Shinjuku for 25 years. This is my first time at this store and I tried their basic menu item the ひごらーめん (Higo ramen). The Soup - is a tonkotsu (pork bone)/chicken soup simmered for more than 20 hours. The soup is creamy white in color, its taste is a rich tonkotsu broth with just a little of the tonkotsu smell. 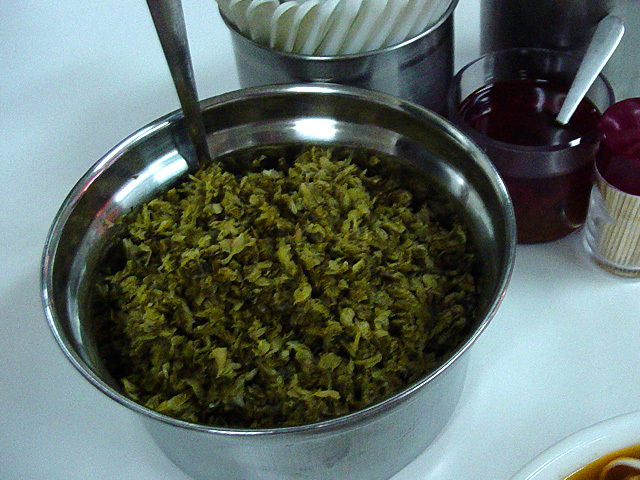 An oil infused with the aroma of fried garlic is added to the soup that adds depth to the ramen. The Noodles - are medium thin straight noodles cooked firm. The Toppings - are tender cha-shu pork, kikurage mushrooms, nori dried seaweed and spring onions. The cha-shu was delicious and the kikurage had a nice texture to it that matched well with the ramen. Overall - a very good, authentic Kumamoto style ramen; In a time when most ramen shops try new things to attract younger customers, it's nice to try a ramen that just sticks with an old formula. While I enjoyed the old school taste of Higonoren, I know they will have a hard time competing with new comers like Nantsuttei or large chain stores like Ajisen. This might be the best Kumamoto style ramen in Shinjuku station. 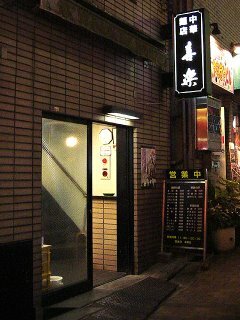 Higonoren is on the South East side of Shinjuku station, just a 3 minute walk from the South station entrance. If you are going out of your way to eat at a ramen place like Kyokuhou then you must be a huge fan of ramen. Located deep in the heart of Kabukicho Kyokuhou is surrounded by love hotels and shady bars. I heard that this place has an authentic Asahikawa style ramen so I made the trek out here to try their 正油ラーメン (shoyu ramen). 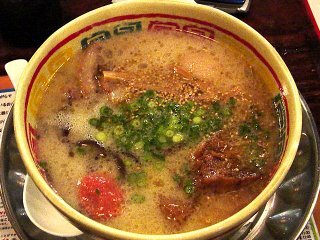 The Soup - is a blend of tonkotsu (pork bone) soup, seafood (dried pompano fish) soup, and a vegetable broth. A rich flavored soup where the aroma of of the fish dominates over the others slightly. True to its Asahikawa origins where it can get really cold in the winter, the soup was served very hot. 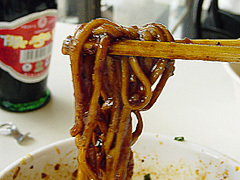 The Noodles - are very good, a medium thin curly noodle that is cooked firm. These noodles are dense and chewy, felt like eating a slight variety of Hakata style ramen. Still, a good match with the rich soup. The Toppings - were average. Cha-shu pork that could be a bit more tender and flavorful. Menma bamboo were a bit soft. Lots of spring onions. Overall - out of the many Asahikawa ramen that I have tried this is my favorite. 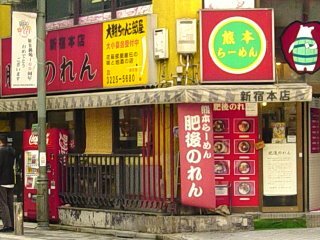 If I was in Shinjuku on a cold winter day I would take the walk here just to get warmed up with Kyokuhou's rich, hot soup. The store is kind of hidden away from all the traffic so it was slightly empty when I last visited there, sure hope it doesn't go out of business anytime soon. Jyangara Ramen is yet another Hakata style ramen chain that has joined the competition in Tokyo. 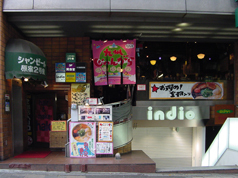 Located in Harajuku, Jyangara is just a stones throw away from the train station. During my visit I tried the 九州じゃんがららあめん (Kyushu Jyangara Ramen). 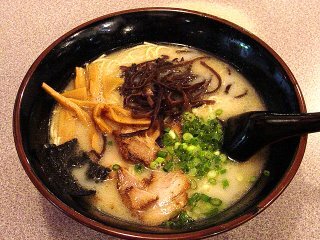 The Soup - is a tonkotsu (pork bone) broth that seems a bit thinner than most of the other Hakata ramen places. The ramen shop itself was filled with the signature tonkotsu smell but the soup was surprisingly void of the smell. The Noodles - are thin, straight noodles cooked very firm. Standard Hakata style noodles, these dense noodles absorb some of the soup without becoming soggy and are a great match with the rich soup. The Toppings - include a thick slice of cha-shu pork, cuts of kakuni slow cooked pork, kikurage slice mushrooms, menma bamboo, and mentaiko (cod roe pickled in sake and red chili powder). The cha-shu and kakuni pork are both very tender and tasty (maybe a bit too much fat). Overall - a pretty good Hakata style ramen. I tried the Kyushu Jyangara ramen which is lighter, if you like a richer, thicker soup then you should try their ぼんしゃんらあめん (bonshan ramen). 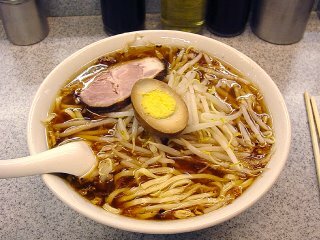 Jyangara ramen is located west of the JR Harajuku station right next to the stairs for the pedestrian sky bridge, you need to walkup a flight of stairs to get to the store. GuaiWeiMian is one of the most popular noodle shops in Chengdu, named after their signature dish which I like to translate as "funky flavored noodles". I came here with my friends and co-workers during lunch time on a busy weekday. 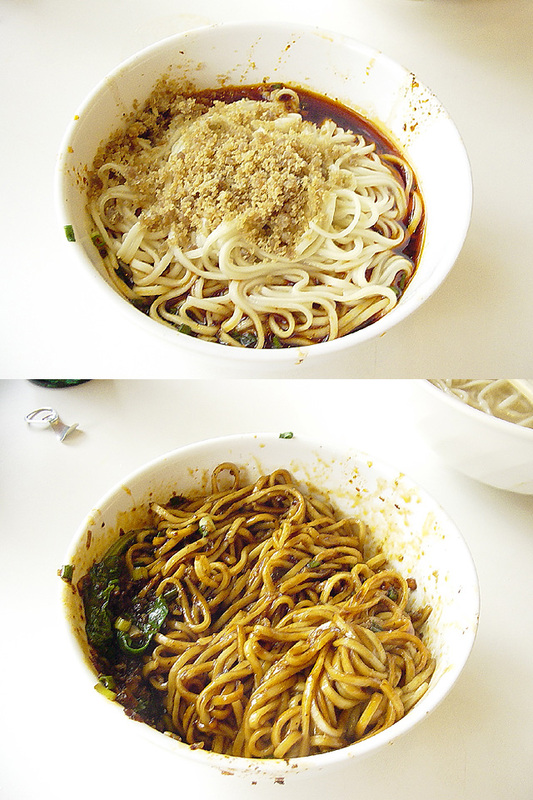 We ordered 5 different noodle dishes but I'll introduce their 怪味面 (GuaiWeiMian), funky noodles here first. The Soup - is a strange mix of many flavors and aromas. A blend of pork based clear broth with a strong seafood/shellfish soup, cooked with many exotic Sichuan spices and chili oils. The soup's flavor is quite strong and probably meant to be eated with the noodles rather than eaten separately. Not very spicy with just a trace of the numbing spiciness from the Sichuan peppers. The Noodles - are medium this straight noodles cooked on the soft side. I prefer them a little firmer but I doubt any of these places will cook to your request. The Toppings - pieces of soft cooked pork, mushrooms, shell fish and peanuts. Probably from the stew and doesn't provide much extra flavoring or texture. Overall - okay, I'll admit it, I haven't figured out this noodle yet. I know I like it, but have no clue why I like it. I can't quite put my finger on the strange mix of flavors, which is why I come back and try it again and again. I know visually it won't win anybody over but it has a taste that grows on you. 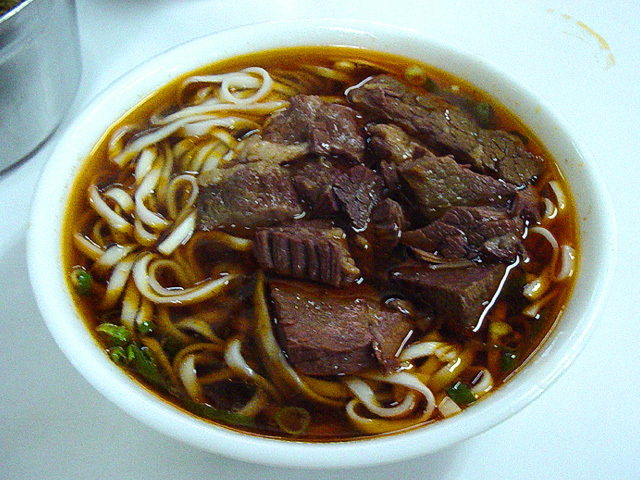 LaoWangJi has been serving beef noodle soup since the 1960's, long considered the standard for Taiwanese beef noodle soup it has withstood the challenges from a lot of new comers and remains popular until today. It has been a while since I ate here and during my last trip I ordered my long time favorite 紅焼牛肉麺 (braised beef noodle soup). The Soup - is a dark colored soup made by stewing beef and Chinese herbs and spices for nearly half a day. Unlike some of the newer places that add a lot of exotic ingredients to the soup such as different vegetables, fruits or spices, LaoWangJi's just uses a reserved amount of Chinese herbs which allows you to savor the flavor of the beef more. 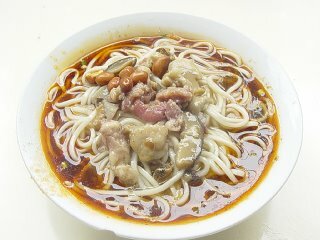 The Noodles - are thin, flat medium width noodles cooked medium firm. These noodles are springy and chewy, a very good match with the simple flavorful soup. The Toppings - are big slices of beef. While not as tender as some other places it is still flavorful and delicious. There is also a bowl of pickled green vegetables on every table for you to add as much as you want to the beef noodle soup. These pickled greens have a sour flavor that adds more depth to the soup and goes great with the noodles too. Overall - I highly recommend this place. This is the store that started my love for ramen noodles. I must warn you that this place is old and not the fanciest place to eat, about the same level as an open foodstand. 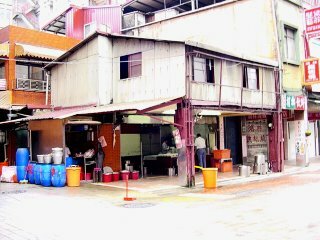 But if you want to try some authentic, old school beef noodle soup then this is the place to get it. 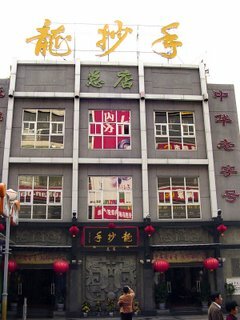 LaoWanJi is located at TaoYuan street behind the capitol building near the Ximen subway station. The store actually doesn't have any signs, so use the store photo above as reference. 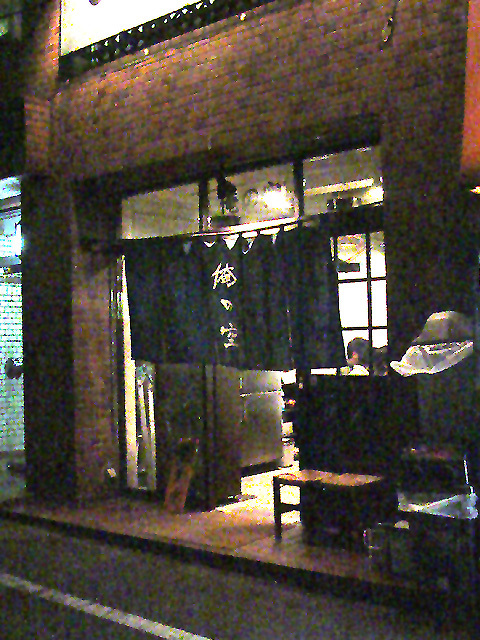 Address: 15 TaoYuan Street, Taipei. 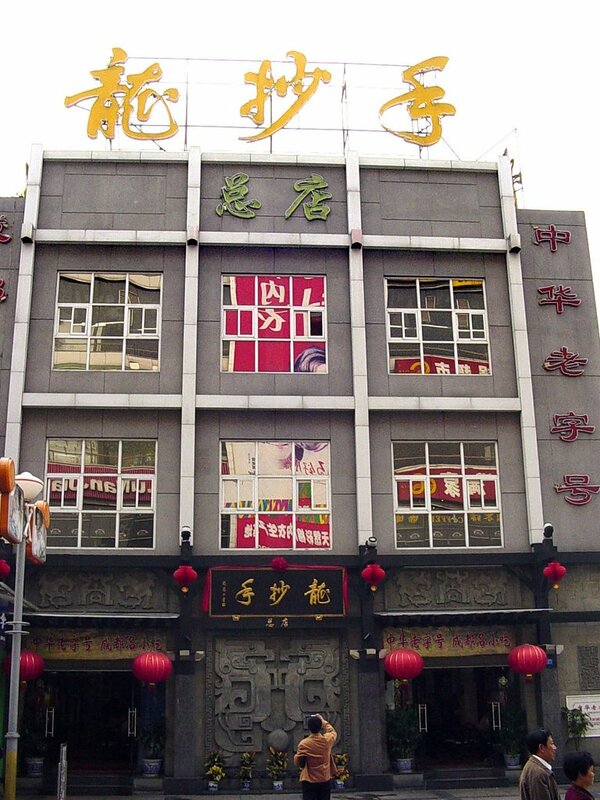 Niu-Wang Temple is a noodle chain store in Chengdu that has a noodle dish called 怪味面 pronounced "guai-wei-men". 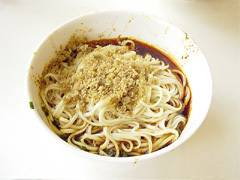 Guai-wei-men's literal translation is "strange flavored noodles" or funky noodles as I like to call them. Here I try the funky noodles for the first time ever. The Soup - tastes funky. True to its name this noodle's soup is quite strange. First of all it has a smell that reminds me of the tonkotsu ramen in Japan, but the funkiness doesn't stop there. The soup also has some fishy smell from dried squid/fish/shell fish and a lot of mysterious Sichuan spices. The soup is not very spicy though it has a trace of Sichuan peppers that numb you just slightly. The Noodles - are medium thickness straight noodles cooked on the softer side. The noodles themselves aren't that delicious in flavor or texture and slightly dissapointing. Though I later find out that this is the preferred type of noodles for this area. The Toppings - are slices of pork, shiitake mushrooms, bits and pieces of squid and shell fish, and some peanuts. Most of these toppings have been cooking in the soup for a very long time and are hardly discernable. They are all soft and soggy and you hardly notice them when eating the noodles. Overall - A strange noodle that isn't for everybody. If you tried the heavy Hakata style ramen of Japan and liked it, or if you tried the stinky fermented tofu or thousand year egg and liked it, then these funky noodles might be for you. I actually liked it quite a bit but have since found others places in Chengdu that serve better funky noodles which I hope to write about in the future. 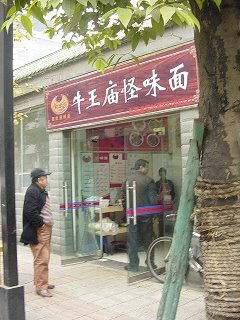 The store that I went to was right behind the Sheraton Hotel in Chengdu, but I've seen the chain stores all around Chengdu. Just look for the red sign with Chinese writings on it as in the photo. 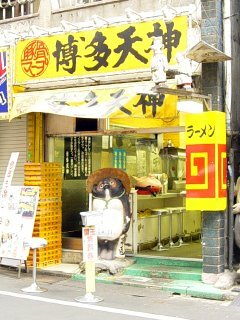 Kujira ken is a famous ramen chain from Yokohama that specializes in old school 支那そば (shina-soba) or Chinese style noodles. I visited their store in Shinjuku station which is located on the 7th floor of the LUMINE EST department store. During my visit I tried their basic 支那そば with flavored boiled egg. The Soup - was a very light yet complex and interesting soup that is a blend of three different broths. First it starts out with a dried bonito/sardine soup, which is then blended with a pork bone/chicken soup and finalized with a vegetable/fruit broth. The seafood flavor slightly dominates over the others but you can still notice the trace sweet flavors from the vegetable and fruits. This is a soup that I will want to try again and again to figure out. The noodles - were very thin, straight noodles cooked very firm. A very good match with the complex soup. The Toppings - played a more supportive role. There were a slice of cha-shu pork, naruto fish cake, nori dried seaweed and some boiled green vegetables. The cha-shu pork was lightly seasoned, very tender and delicious. The boiled egg was flavored and slightly sweet. Overall - I highly recommend this place to everyone. It is nice to have one of the best shina-soba chains in Shinjuku since a lot of ramen stores in the area are the heavier, oily variety. The soup is light and flavorful, a nice alternative to those who aren't a fan of the other oily ramen of Japan. The store in Shinjuku is in the LUMINE EST department store located to the East side of Shinjuku station. The Kujira-ken store is right next to the elevators on the 7th floor. 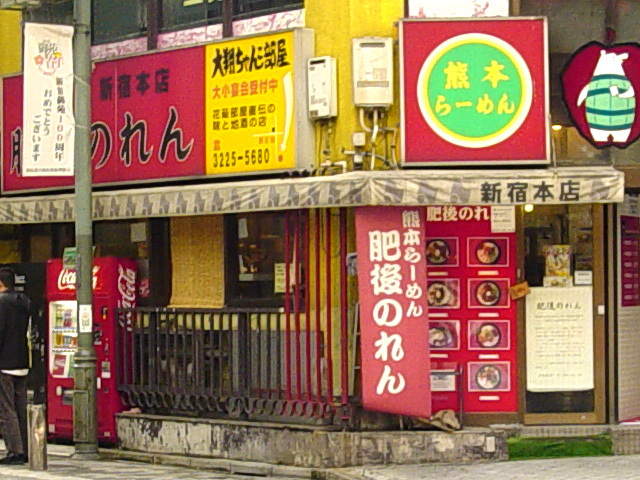 Hakata-Tenjin is another Hakata style ramen chain that sprouted all over Tokyo from 2003. 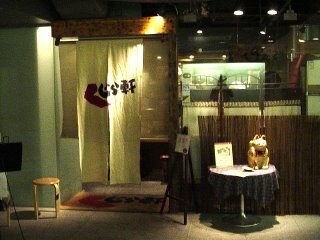 I went to their store in Shinjuku’s Kabuki district. I ordered a ネギラーメン (Ramen with extra spring onions). 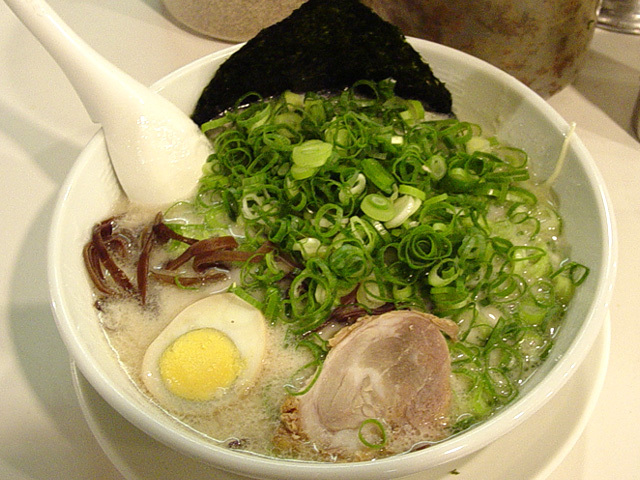 The Soup – is a lighter Hakata style tonkotsu pork bone soup, there is very little of the typical tonkotsu smell. The soup seems to be lacking the punch that most tonkotsu ramen has. The Noodles – are also the standard thin straight ramen cooked very firm. The Toppings – were just okay. Cha-shu pork, sliced kikurage mushrooms, fully cooked boiled egg and spring onions. Like most Hakata style ramen stores there were also a lot of extra toppings for you to add to the ramen such as ground fresh garlic and takana pickled vegetables. Overall – Hakata-Tenjin was acceptable but nothing really stood out for this ramen. The store décor was actually quite crass (it has a statue of a pig and tanuki out front) and I was expecting a less refined ramen more along the lines of Goten or Nandan-Kanden. 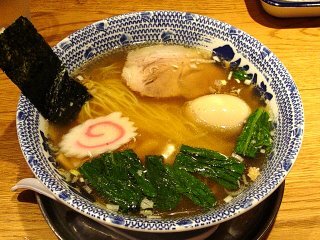 There are many better choices for Hakata style ramen all over Tokyo. Kiraku is an old style ramen house in Shibuya, located about 7 minutes walking distance west of the Shibuya train station. The store was filled with older business men, suprising since Shibuya is always filled with young people. 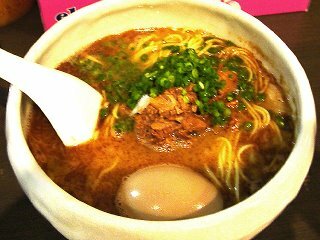 I ordered the 中華麺 (chuka-men), or Chinese noodles. The Soup - is a soy sauce based chicken and pork based clear soup, flavored with fried green onions. Somewhat similar to the soup used in traditional Taiwanese noodles like Dan-zai noodles. The Noodles - are really good. These thick hand made noodles are springy, chewy and delicious. The Toppings - are lots of boiled bean sprouts, cha-shu pork and a boiled egg. The cha-shu and hard boiled egg were just average. Overall - I wasn't that impressed with Kiraku ramen, though their noodles were very good. Kiraku has been around for more than 50 years and has always gotten good reviews from the local ramen fans. This place tasted a lot like the noodles I had in Taiwan, not what I am looking for in ramen in Japan.